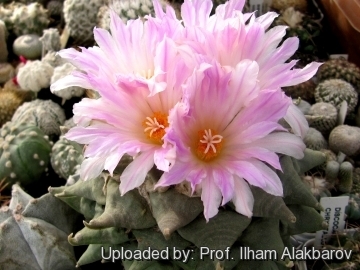 Description: Ariocarpus confusus is a peculiar local form somewhat intermediate between Ariocarpus retusus and Ariocarpus trigonus. This two taxa intergrade in the area adjacent to Aramberri (a natural hybrid?). 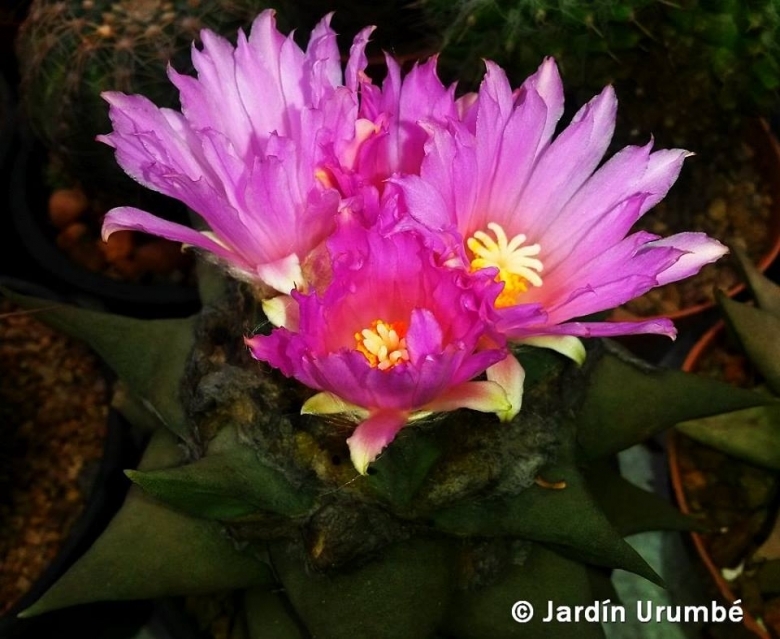 The peculiarity of Ariocarpus confusus is that it usually develops deep magenta flowers (a color not found in any other populations of A. retusus/trigonus), however white or pink flower or variations of the two or even bicoloured flowers in the same plant are not uncommon. Stem: 10 to 20 cm in diameter, 4 to 10 cm tall. Tubercles: Upright tan brownish/green to magenta/green divergent, not crowded or basally compressed, acute at the apices, flattened and smooth adaxially, not fissured, incurved strongly, 3-8 cm long, 1-2,5 cm broad, usually more long than wide. Flowers: Extremely variable from Cream-white to rich magenta, 3 to 5 cm in diameter up to 4 cm long. Blooming season: They come in late autumn or early winter. 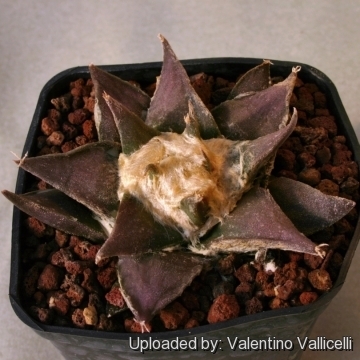 Remarks: Ariocarpus confusus is an extremely variable species. 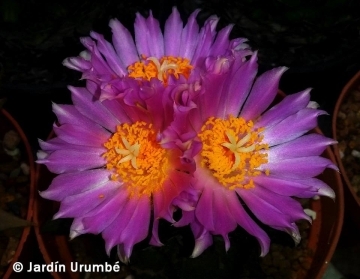 Notes: Ariocarpus confusus is a controversial taxon erected by Halda & Horacek in 1998 to indicate the plants of the Ariocarpus retusus/trigonus complex found in several locations around in the Aramberri region. 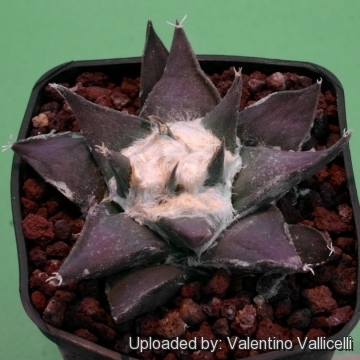 This Ariocarpus are extremely variable in body form, and also in flower colour. Aramberri is located in a valley between two mountain slopes. On either side of the valley one may find population that looks like the typical Ariocarpus retusus while other resembles the typical Ariocarpus trigonus, with a range of intermediates between the two. Morphologically, plants belonging to the confusus species resemble either the retusus ssp or the trigonus ssp. However, they are easily distinguished from either of these retusus sub-species by their interesting variation is in the flower color, which can range from white through to magenta, a color not found in any other populations of A. retusus/trigonus. Bicoloured flowers also occur. Propagation: Seed, but will generally take about 6-10 years to reach flowering size, occasionally grafted.